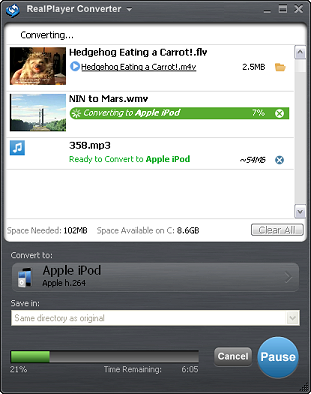 RealPlayer Converter is a video and audio file conversion program. You can take files you created or downloaded from the internet, and prepare them to go anywhere. Use RealPlayer Converter to covert multiple videos into different formats, or the same file into multiple formats. You can even extract the audio track from video files. We've provided you with pre-installed device Converter profiles that have been optimized for popular devices such as the iPod, iPad, iPhone, Smartphones, and MP3 players. Just select the device you want to watch your videos on, and let Converter take care of the rest. Create your own custom device profile. Set audio and video encodings, resolution, bitrate to create a profile that meets your specific needs. Premium Feature - "Advanced Transfer", "PlayPack"
Speed up video conversion, and convert MPEG-2 formatted videos into other formats. Encode videos in H.264 to plays on devices like PSP and PS3.